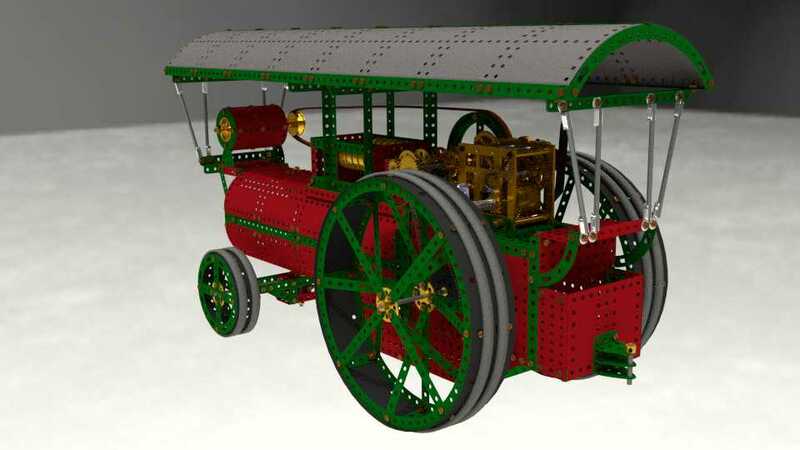 So I have just been cleaning my old Meccano for my grandchildren to play with, having been inspired by the “Windup Toy Tank” WIP here that reminded me of my childhood and the Meccano that my parents bought me. Every Xmas and birthday from the age of 4 up to around 14, when girls and motorbikes became more interesting, I got Meccano presents. I was also provided with a sheet of the required gauge of steel and a drilling jig that Dad made from an old file. I already had the tin snips, files, and other hand tools by the age of 8. Whenever my requests for many new parts fell on deaf ears, I would make and paint them myself. I even made folding jig to be able to bend the tight corners on Meccano parts. Thin “skinning” plates were made from old food tins, so they could be bent to fit the model being made. I am going to make all the parts I need as I go along with the model. This is much easier in Blender than it used to be in the real world I might add. I started off with an image, which has a white background and a gazillion black circles at even spacing as my “Holes” texture, I then use this in the material to cut the holes by mixing in a transparent node. For the plate with the holes around the edge, I just painted white over some of the black circles. The Meccano is brand new at this stage, but may well get scuffed and the paint chipped as I go along. 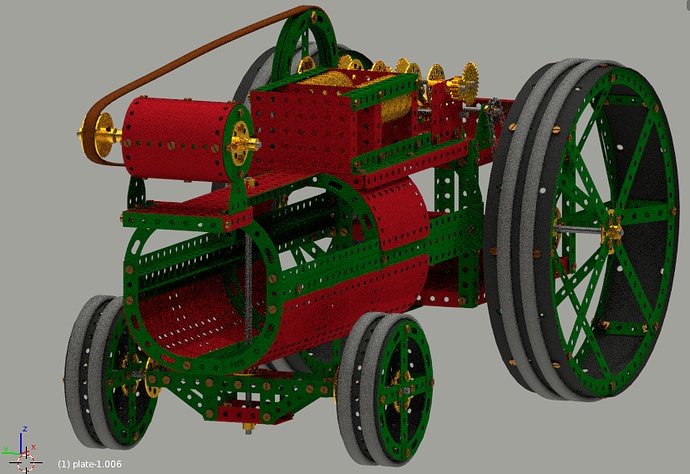 The model will begin to emerge as progress is made - it will be a mechanical model and will be rigged for animation. In my childhood I used an adapted old clock as a clockwork motor until I have enough pocket money to be able to buy an electric motor. 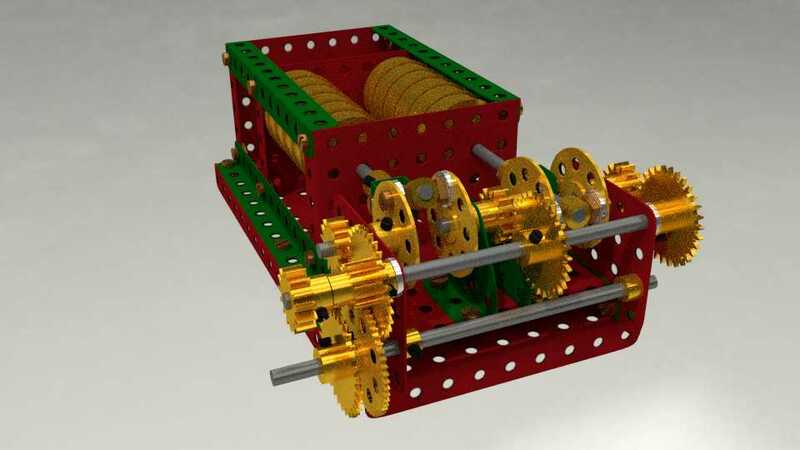 I intend creating gears and chains as I have in my Meccano set still to this day, so at least I have something physical to work with as my patterns. 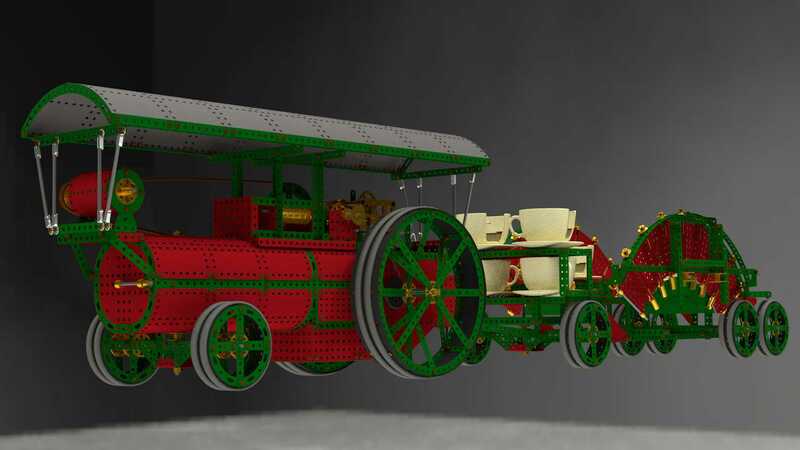 Some of the parts I made were not standard Meccano so if you spot something that was never in the official catalogue, it was “Clock-made”. Well at first I thought it might be two steam pistons driving a crankshaft, but I cant really see the crankpin on the bigends connected to the crankshaft. So maybe it some sort of valve pump using straight push rods sitting on a cam shaft, like you see in the old tin mines. @coops - right first time! 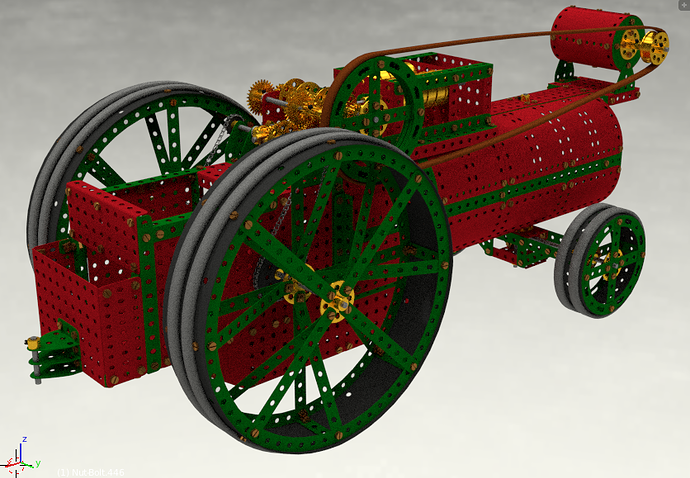 It is a two cylinder steam engine, but it will form part of a bigger model, one I made over and over again. Exactly what that is will emerge later. Here is an update with some gears added (I had lots of gears as presents! 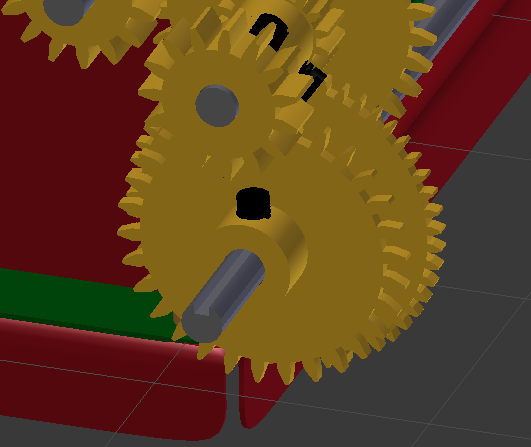 ), the top shaft nearest to the camera has the gears that keep the crank-shaft all in line. The outer two gear trains provide for two speeds to the lower shaft. 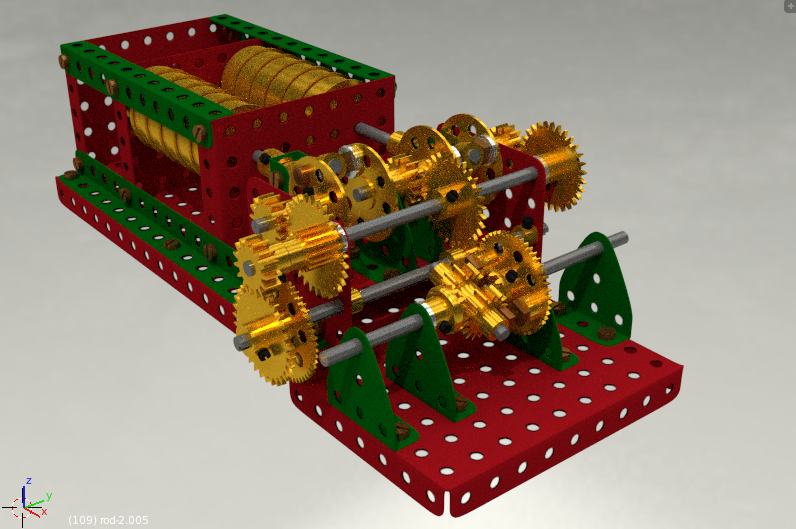 I will add the mechanism that simply moves the two large gears on the lower shaft so that the one with 1:2 ration engages or the other with 1:3 ratio engages, this shaft will drive a differential. Taipan - thanks for the kind words, a motor will be required - I think I will add the clockwork one I made as a kid from an old clock. Now that you moved the camera yes it is possible to see the end cranks, two things, are those cams that the end cranks are bolted into brass or metal, I remember Meccano yellow being a very deep canary yellow. 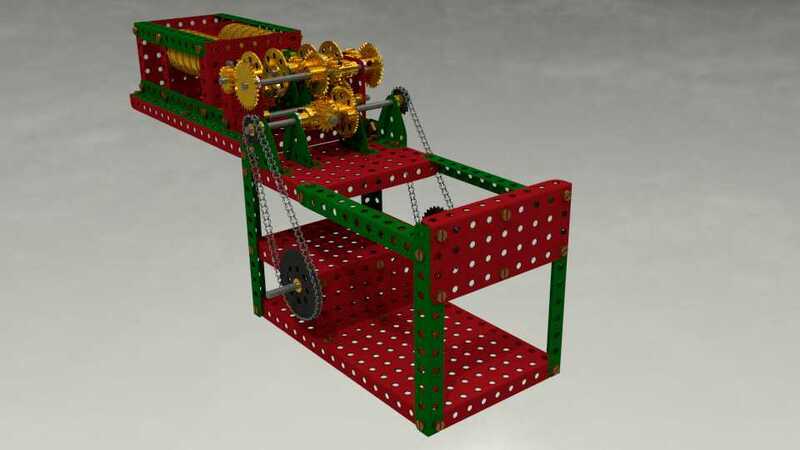 The other is considering you got variable gear ratios is this to be one of the Meccano steam driven cranes. 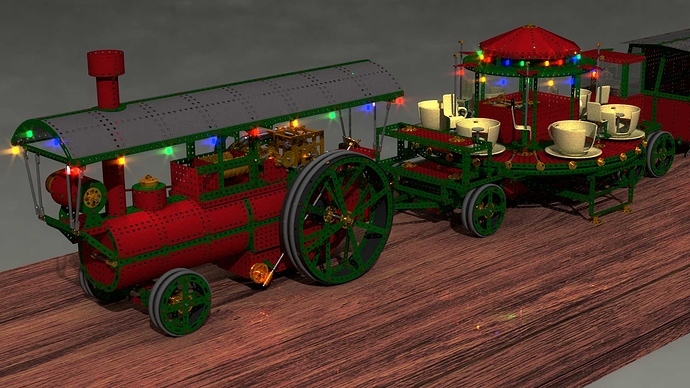 I know they did a huge dockside crane in red and green. No - it’s not the crane, although that was a superb model. This one was never in the Meccano catalogue. The crank plates are brass - they were a brass disk pressed onto a standard boss. 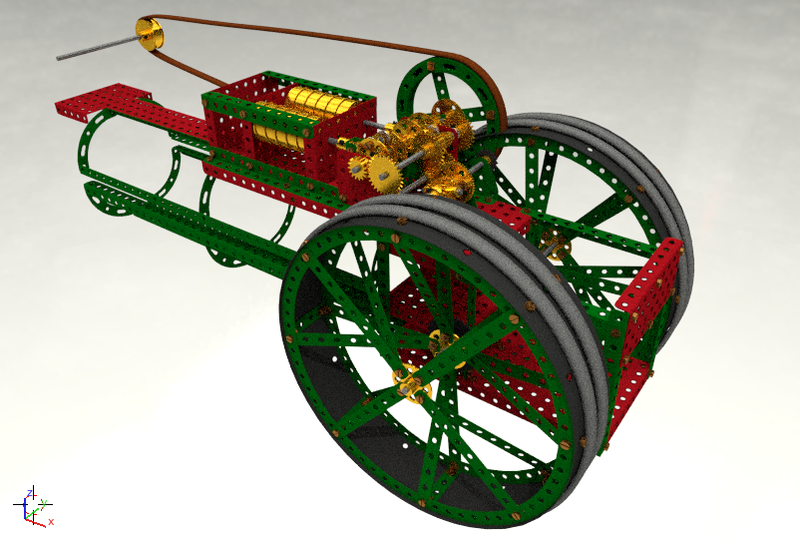 The rods on the diff will carry chain gears, this is a little clue to the final project. But they are all rigged and work properly. The tyres and drive belt were made from rubber strip, after nearly 50 years, they have long perished, but I still remember what they looked like. In fact ALL the rubber tyres, etc. off all the wheels I had have perished and turned to powder/gunky mess. The black plates that form the outer surface of the wheels are Clock-made, but I think there was something similar in the No 10 set. I saw on a website an original unopened No 10 set - the owner wanted £4,000 for it!!! Your Render looks like old photo…Really nice. 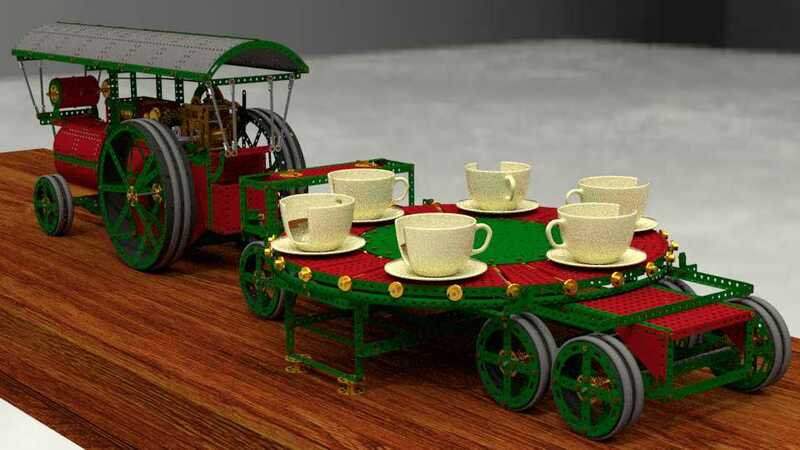 Hmmm - Tractor or Train eh? Now I have enough wheels on it, a train is probably not the case. 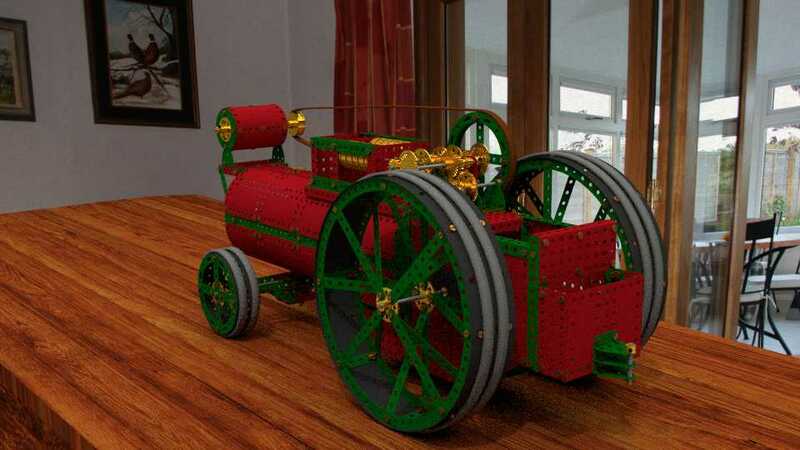 The biggest clue to get it exactly right is the generator on the front and the top mounted steam engine. As for rigging, I rig it as I go, so when one piece is in place, it gets rigged, that way I don’t lose sight of what does what. 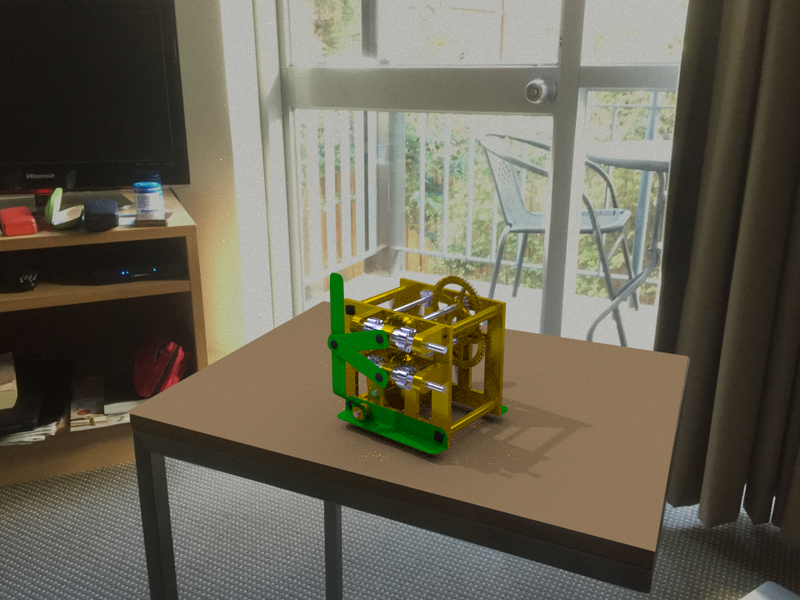 In the animation, the model will move along the table, so that will present new problems. Cheers until next time, Clock. If I did not know it is a 3 d model…I would think it’s a really Meccano Model. Very nice Clock, hope to see it finished when you get back, enjoy your trip. Greetings from “Down Under” !!! thanks for the comments, I’ll be back end of Nov. 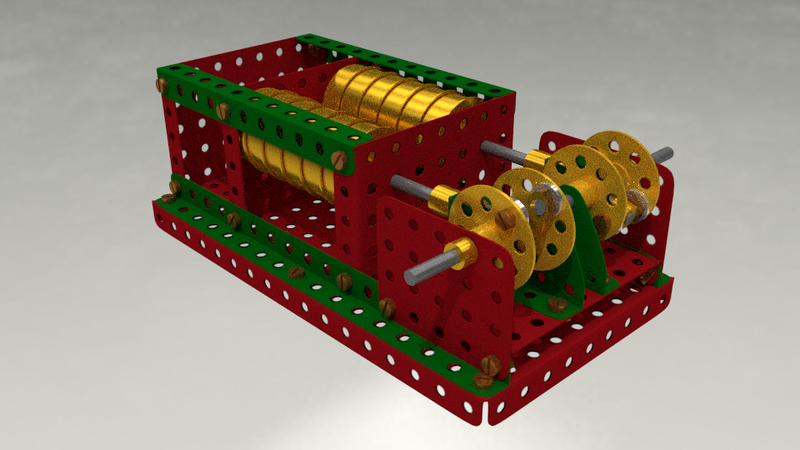 I used the chime train from an old long case clock in my youth, so this is probably close to what I had at the time. PPS. Sorry if this post is upside down, but I am in Aus, not at home. 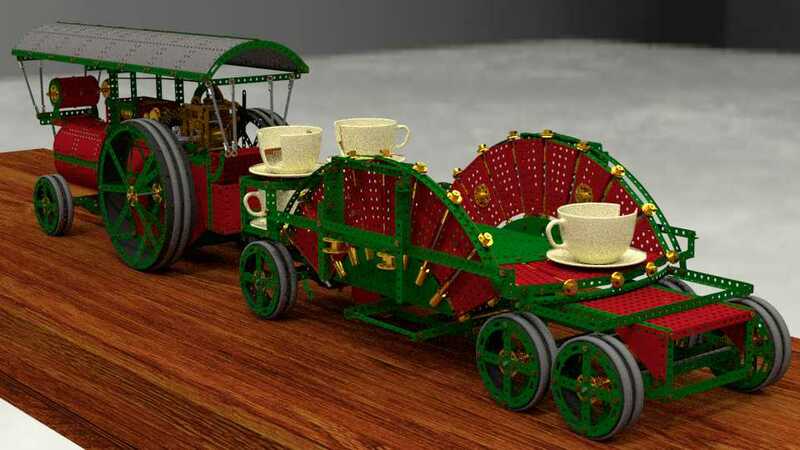 Hopefully you can see where I am going with this now, I never had enough Meccano to make both the Showman’s Engine and the “Tea-cup” Ride, so this is the first time I have seen them together! 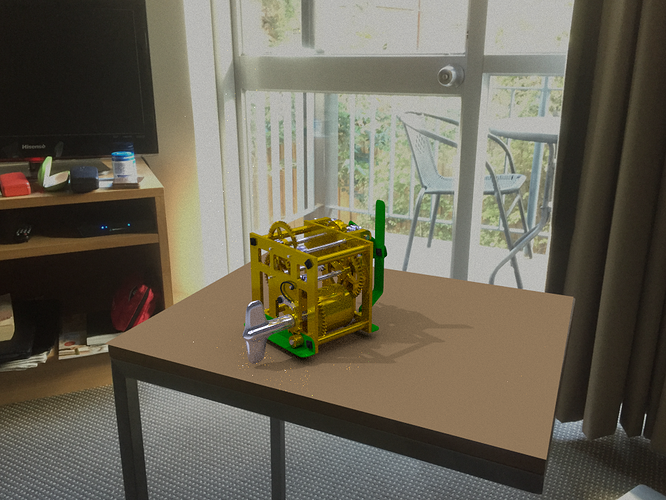 Here is the ride stowed for moving, in Blender this is all rigged so I only have to move an Empty to get to the stowed position, in Meccano it involved more time and refitting some bolts, etc. This should show the materials better. I wonder if I should start distressing the Meccano at all - what do you think, would some scratches look better?